Dental chair - the chair of special design, which gives the patient a position convenient for the doctor in dental care. Dental chairs are stationary (Fig. 1)used for equipment of dental clinics, hospitals, and light type - marching (Fig. 2)used when working in the mobile offices. Marching dental chair (latest designs) consists of components made from light alloys, and rack has a lifting mechanism in the form of a parallelogram, with which you can easily install the necessary height of the seat. 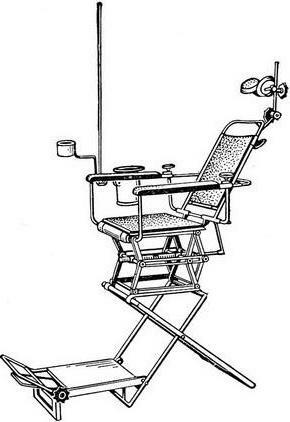 As a camping chair, you can use a chair with a fixed a special headrest, produced in the USSR. Fig. 1. 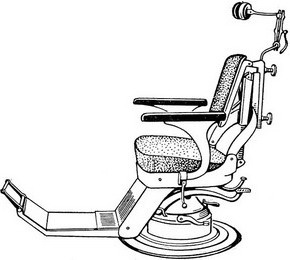 Stationary dental chair. Fig. 2. Dental chair light type (demountable).